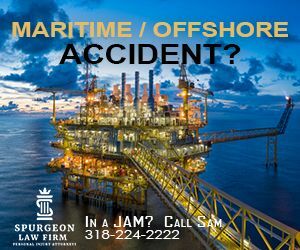 You may be entitled to compensation if you have sustained a personal injury while working on an offshore oil drilling rig, boat, ship, barge, cruise ship, fishing boat, cargo ship or any other seafaring vessel. If a member of your family has sustained a fatal maritime injury, you may also be entitled to receive compensation by filing a wrongful death claim. To learn more, contact an experienced admiralty and maritime Attorney at Spurgeon Law Firm. We represent clients throughout Louisiana in admiralty and maritime claims, including claims pertaining to the Jones Act and/or Death on the High Seas Act. Given our experience, we can provide the knowledgeable and vigorous representation you require. We have represented clients who have sustained a wide range of injuries. Offshore accidents often result in serious injury or wrongful death. If you are injured offshore, the vessel owner is likely to have started to prepare its defense before you even reach land for treatment. The company may hire lawyers, doctors and other experts to minimize any claim you or a loved one might have. It is important you contact an experienced offshore accident attorney to protect your rights. Contact Spurgeon Law Firm today regarding your offshore injury claim. We handle all offshore accident injuries, including offshore rig injuries, tugboat and barge injuries, work boat injuries, ferry injuries, inland marine injuries, floating crane injuries and commercial fishing boat injuries. Injured maritime workers are entitled to compensation for the impact their injuries have on their lives. At Spurgeon Law Firm, we understand the different maritime laws and use this knowledge to maximize our clients’ recovery. Whether your claim arises under the Jones Act, the Death on the High Seas Act, or the Longshore and Harbor Workers’ Compensation Act, we will work hard to make sure you receive all of the compensation possible. The term “vessel” has been broadly interpreted to include offshore oil drilling rigs and drill ships, boats, ships, barges, tugboats, cruise ships, fishing boats and other seagoing vessels. If you feel you may have a Jones Act claim, it is critical that you contact an attorney as soon as possible. The amount of time you have to obtain compensation in a Jones Act claim is limited by a statute of limitations. For the experienced and knowledgeable representation you need, contact Spurgeon Law Firm. We represent clients in Louisiana in Jones Act claims as well as other matters regarding admiralty and maritime law. As an injured seaman, you may be entitled to maintenance and cure benefits. Maintenance is a weekly check that an employer must pay to certain workers when their regular pay is halted due to an injury. Cure benefits are reasonable medical benefits received while a worker recovers from an injury. Jones Act claims can be highly complex. A Jones Act claim is different from a workers’ compensation claim because you must be able to prove negligence to obtain compensation for your injuries. Our experienced Jones Act attorney is highly skilled and dedicated to obtaining the compensation to which you are entitled. If you have recently suffered an injury pertaining to admiralty and maritime law, contact Spurgeon Law Firm today!